In a world that is more complex and uncertain than ever before, what is most valuable? Creativity, Empathy, or Technology. You might argue it's technology. After all, everything that can be digitized is being digitized. Over the last 20 years, we've seen changes that are unprecedented. The Internet has changed how we live, work, play, and interact. Social media has exploded. Nearly every person on the planet, it seems, has an Internet connected mobile phone. We can literally stay connected every minute of every day. Self-driving cars are a reality. We have the Internet of things, big data, robotics, artificial intelligence. Digital is how the world is changing. Fewer people are creating a larger portion of global wealth today. It takes fewer and fewer people to produce more and more. The innovation economy is already here, but it's accelerating. Digital is going to continue to drive change. And change will happen even faster. And yet, the things that are becoming more valuable for the future are the things that cannot be digitized or automated. Traits that are human-only will become more and more valuable. Traits like creativity and empathy. Creativity is thinking in novel ways. It's solving problems. It's developing new ideas, finding better opportunities, and combining old things to create new possibilities. Empathy is the ability to understand, connect, and see the world through other people's eyes. It's moving closer to people. It's having social skills to communicate, accept differences, and find common ground. In order to adapt in this rapidly changing world, we must embrace technology. It's important. But more importantly, our students will need to develop creativity and empathy. It's not about what you know. It's about what you can do with what you know. Can you work with people? Can you add value to people? Can you create something new and interesting? These disruptive trends show no signs of slowing. But are schools keeping up? I don't think so. Things are moving so fast, it's hard to keep up, even for the schools that embrace change. Creativity and empathy are not considered the core work in most schools. They are extras, add-ons, and enrichment programs. But I think we have it flipped. Start with creativity and empathy and use those to propel learning of content and academic skills. It's very different than the type of learning I had when I was in school. We plowed through content and curriculum and produced right answers year after year. We jumped through all the hoops as instructed but probably didn't learn how to take much initiative. And that worked okay in a world where a high school diploma could get you a job, maybe even a career. And a college degree almost assured you a privileged place in society. Those days are gone. We cannot afford to prepare students for the world we grew up in. We must prepare them for the world they'll live in. How do you see the role of creativity, empathy, and technology in the future? 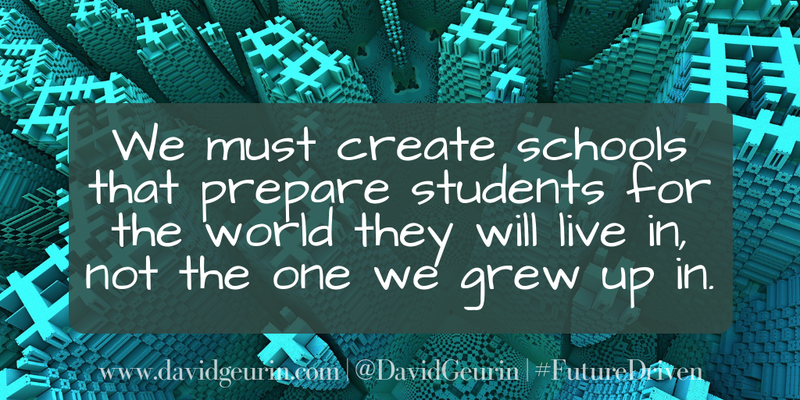 What will our students need to thrive? I want to hear from you. Leave a comment below or respond on Facebook or Twitter. 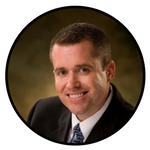 I met John Norlin this summer at the National Principals Conference and knew right away I wanted to learn more about his story and his work as co-founder of CharacterStrong. One thing led to another and luckily we were able to have him present to our staff earlier this week. It was awesome. Many of the ideas he shared are reminders. He pointed this out more than once. These aren't new ideas. "I'm not here to inform you today as much as I'm here to remind you," he said. We all know how important relationships are. We know how important it is to develop character. We all know academic skills won't take you very far unless you can also work effectively with people. We know kindness counts. But even when we know these things, we can get better at doing these things. We can become better people. And we can help our students become better people too. But we have to be intentional. We have to work at it. We have to develop our own habits. And it's hard work. It doesn't even necessarily take more time. But it does require us to use the time we have in very intentional ways. The reminders John shared are very important reminders. He shared the message in a way that inspired us and helped our staff build even stronger connections. I think we left more excited about our work and more committed to our students. I think we left more committed to each other too. -Everyone NEEDS character development. All of us. -We are built to be relational. Stronger relationships help build a stronger school and better learning. -We need purpose more than we need happiness. Most are trying to be happy, but deeply fulfilled people know their purpose. -Students need a deeper why. So many don't know their purpose and how school fits with that purpose. -Many of our students need hope. In truth, we all need hope and we need to be hope for each other. -Our school culture is built on behaviors. Character is revealed by behaviors. We make thousands of choices daily. 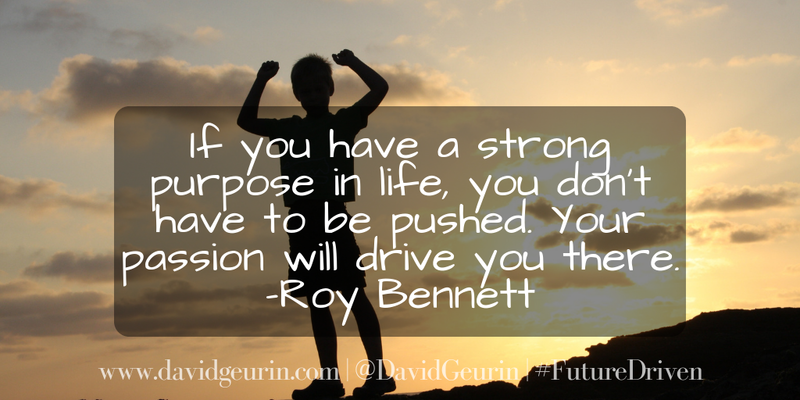 How are your choices contributing to the culture of your school? -Such an important question: What have you done for others today? 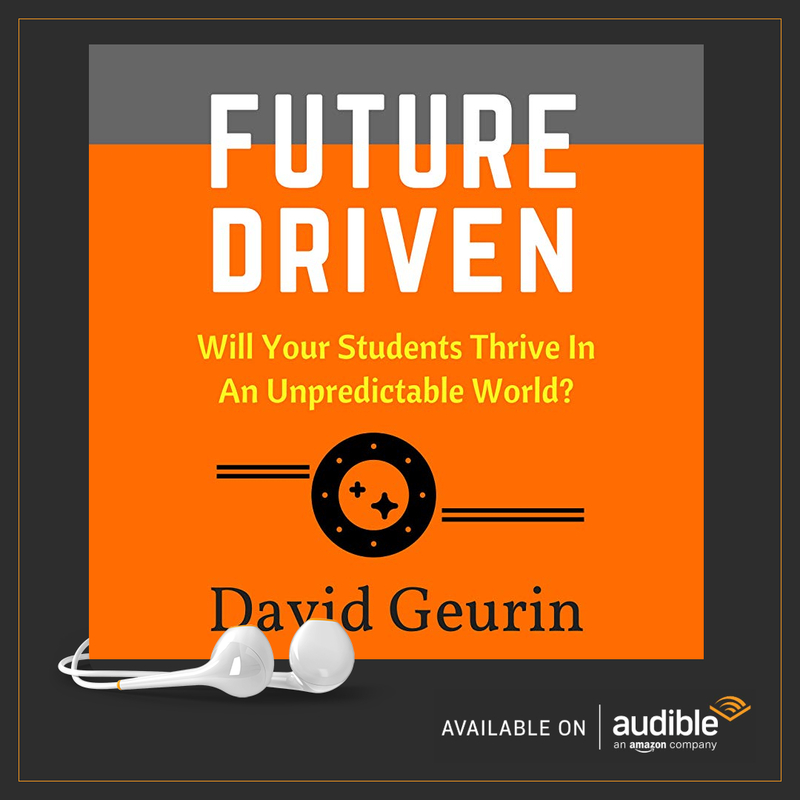 In Future Driven, I wrote about my efforts to greet students each morning. I had always tried to be visible and friendly as students arrived to school in the morning. But then I decided to be more intentional. I made sure I was at the door to welcome as many students as possible, to learn as many names as possible, to make the greeting as extraordinary as possible. One day I had some help with my greeting routine. One of our students, Nathaniel, was already at the bus drop off door. He was holding it open. I didn’t think too much of it, but then he started showing up every day. He’s always there now ready to help, even before I arrive. He’s quiet, so he doesn’t say much to the other kids as they come in, but many of the other students will tell him thank you as they walk by. And I’ve gotten to know Nathaniel a little. He is passionate about professional wrestling. He looks forward to watching it on TV each week, and he asks me if I watched it too. I asked him if he knew about Hulk Hogan and Andre the Giant, wrestling heroes from when I was a kid. He just grinned and said he heard of them. I also learned a little about his family, where he lives, and some of his favorite things. I even learned we have 22 buses that drop off students in the morning because Nathaniel counted them for me. Isn’t it amazing the impact our small actions can make? Just showing up in the morning to greet kids inspired Nathaniel to do the same. Our investment in people has a way of multiplying. Nathaniel wanted to help out. I think he feels good about holding the door open in the morning. I know I feel better each day I get to see Nathaniel and hang out with him for a few minutes. We never know when a simple conversation with a student might spark something lasting and worthwhile. 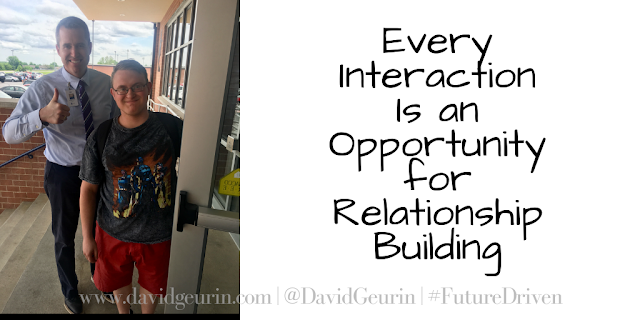 Every interaction is an opportunity for relationship building. Nathaniel was part of the Class of 2018. As graduation approached this past May, he asked me over and over, "Who are you going to get to replace me when I graduate? He had faithfully met me at the door each morning and now as he was about to leave our school, he was concerned about who was going to do his job. He had purpose. He was selfless. He was kind. I told Nathaniel he would be really hard to replace. I asked if he had any suggestions for who could took his place. We talked about a couple of kids he thought might work out. And then a few days later he walked across the stage and was awarded his diploma. When I shook his hand, he smiled and said, "Who are you going to find to replace me?" A few weeks ago, one of our teachers came into my office and shared that Nathaniel was very sick and in the hospital. A couple days later I went to the hospital but couldn't see him because of the limited visiting hours in intensive care. And then on Friday morning, September 28th we got the news that Nathaniel had passed away. It was crushing news. It still hurts as I'm writing this post. But I'm so grateful that my story intersects with Nathaniel's story. I'm thankful I can share about our time together. I'm thankful I can share about a student who had purpose, who was selfless, and who was kind to others. He wasn't worried about being popular, or cool, or a big deal. He just wanted to make a difference. I can't even imagine the kind of greeting Nathaniel received in heaven. He certainly deserves the best. He might even get a job holding a door open for others arriving on the scene. For those of us still doing our best here on planet earth, we need reminders. Let's not forget every interaction is an opportunity for relationship building. I've been thinking quite a bit lately about negative student behaviors and how we respond effectively. 1. Judge behaviors, not intentions. It can be really easy to become judgmental about negative student behavior, especially when it's repetitive. It's always appropriate to be corrective about non-learning behaviors, but it isn't right to place ourselves in a position of greater worth than the student. We might think, I would never do that. It's like we think we're superior in some way. And then we make generalizations about their motives based on the behavior. We act as if we know what's going on in the student's heart. That's the type of judgment that causes resentment and steals dignity. Judgement isn't always a bad thing. We actually know having good judgement is a good thing. That's how we know when something is right or wrong. But relationships get crazy when we start to judge motives. That's not ours to judge. Judge behaviors. They are observable and there are standards that must be held. Don't judge intentions. We can never know another person's heart. 2. 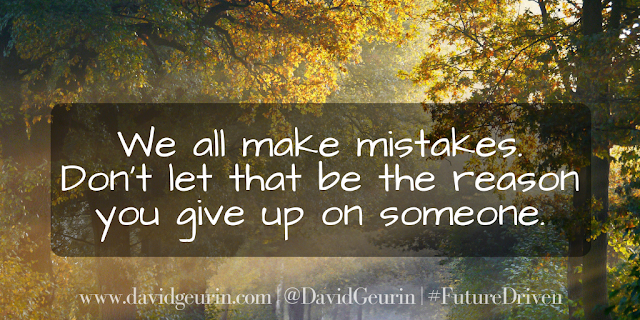 We make mistakes too, just like our students. Every negative behavior a student exhibits is probably closely resembling a negative behavior I've exhibited in my own life at one time or another. If I'm really honest with myself, it's probably like I'm looking in the mirror. I may not have done that exact thing to the degree that it was done, but I've struggled with that issue at some point and acted in a similar manner. There are only so many categories of mistakes, and I'm pretty sure I've covered them all at one time or another. 3. Correct the issue and preserve the relationship. Number two is really important because it reminds me to have empathy, to be understanding, and to work with a student through the issue instead of towering over them and being iron-fisted about the issue. We want to correct the issue and preserve the relationship. We need to walk through this with the student. 4. 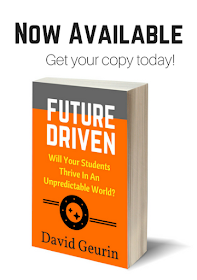 Are there certain student behaviors that really push my buttons more than others? The things that push my buttons the most might be the things that I actually struggle with the most. It's ironic, but often we are less forgiving and less patient with the behaviors that are most like the ones we struggle with. Think about an issue that is a struggle for you. Are you especially hard on students when they make a mistake in this area? Maybe not if they make the mistake in the same way you do. But if they make it in a different way or to a greater degree, look out. It might push all your buttons. 5. Change the environment to help the child change his or her own behavior. When students show up poorly and have behaviors that are destructive, I need to also look at the environmental factors at play. If I was in the same environment as the student, might I also act in this way? What can be changed about the environment to help the student make different choices? That does not relieve the student of responsibility or accountability for bad decisions, but I don't want to just enforce accountability. I want to help create conditions so the student will succeed next time. I think we could all stand to be a little more patient with our students. Heck, sometimes we need to be a little more patient with ourselves too. Mistakes are opportunities to learn more about who we are and to reflect and become stronger, more caring people overall. I would love to hear your thoughts as always. What's on your mind after reading this post? Leave a comment below or respond on Twitter or Facebook.